Welcome to DataCent Data Recovery! DataCent offers you professional hard drive data recovery services when your data is no longer accessible. We recover data from most types of storage media, operating systems and applications. Whether you are a fortune 500 company, a government, educational institution or a personal user, DataCent Recovery has a solution to help recover your data. Our "No Data - No Charge" policy guarantees that we are financially commited and we'll do all in our power to recover your data. It also means that there is no risk when using our services. We do not charge you unless you receive back your lost data. You will only pay for the result you expect. Accurate failure diagnostics by qualified specialists is the most essential part of the whole recovery process. We do it for free. We guarantee fair prices for our customers. 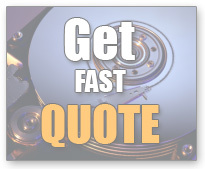 Final upfront quote you get in advance before sending out your drive to us will never change during the data recovery process. Quite often you will be able to diagnose the problem your drive has by yourself before even sending the drive to us. Visit our Common failures and Failing hard drive sounds pages. We follow the hard drive technology precisely and have all the right tools and experience to handle hard drives ranging from Megabytes to Terabytes in size. Our list of supported models you can find on our Supported models page or just contact us. Our fully equipped and trained engineers work in a Class 100 clean room environment and use the latest software and hardware from leading data recovery technology providers such as Ace Laboratories and Deepspar Data Recovery Systems. We also have our own in-house tools for clean room work and files retrieval. If you run PC shop or data recovery company and need a hand with data recovery please ask about our partnership program for special rates and terms.